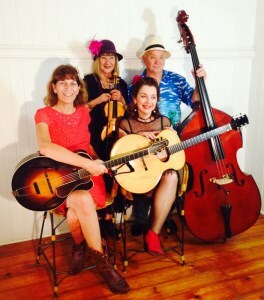 Come and enjoy the catchy rhythms of acoustic arch top guitars, soaring violin, reverberating bass, and smooth harmony vocals with “The Swing Beans”. The Beans have reincarnated themselves and are swinging again, playing those infectious songs from the 1920s to the 1950s, some jazz ballads, and some Texas swing classics. The Beans now comprise Lisa Lombardi and Julie Witney on arch top guitars and harmony vocals, Heather Smart on fiddle, and Roger Brand on upright bass and vocals.